Digital photo frames are cool and interesting methods for displaying your photos and sharing them with others. Digital photo frames don't have to replace your printed photo scrapbooks and albums; instead, they can complement each other. Keep in mind that every digital photo frame is a little different, and some digital photo frames might not have the ability to display photos in the methods discussed here. Use these tips to learn more about making the most of your digital photo frame. If your digital photo frame software has this option, be sure to tell the software to automatically resize your photos to the best resolution for displaying on the photo frame. You don't need a large amount of resolution to display photos at full size on a photo frame LCD, and lower resolution photos don't require as much storage space within the digital photo frame. Using the digital photo frame's slideshow feature is probably the best way to display your photos. The photos will change after a set period of time, running through all of the images stored. Most digital photo frames offer three different methods for loading photos: A USB flash drive, a memory card, and internal memory. If you have a large number of photos you want to display, you probably will want to turn to a USB drive or a memory card, as those storage methods typically can hold many more photos than the digital photo frame's internal memory area. With some frames, you can add an audio file to the slideshow, giving you the option of playing music in the background as the photos scroll through on the screen. Again, you can upload these through the same methods that you upload photo files. Some digital photo frames require that you keep a USB device or a memory card permanently attached to the frame. Others allow you to copy them to internal memory, which means you won't have the added expense of buying an extra USB device or memory card that's devoted to the digital photo frame. Since they're pretty inexpensive, having an extra memory card that's just for the digital photo frame can be a good idea. 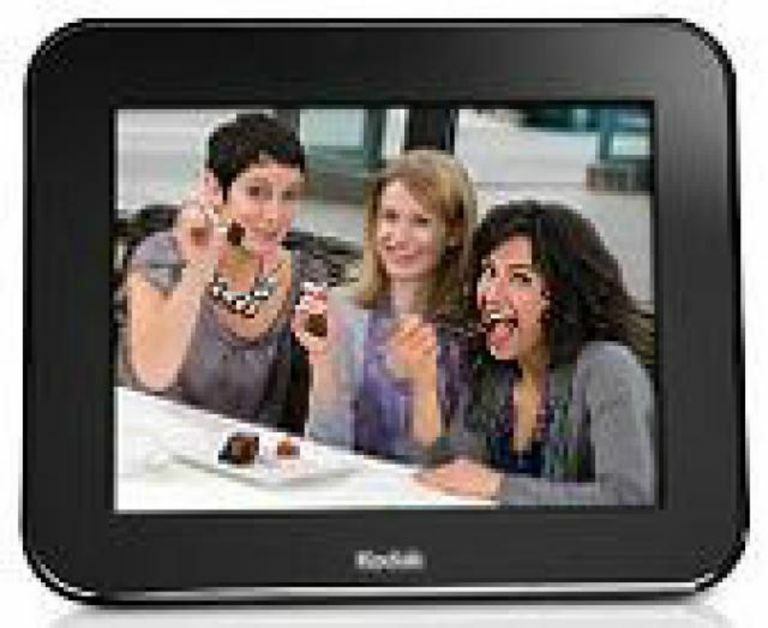 Some digital photo frames run only from AC power, while others give you the option of running from batteries. Although using a battery option can get expensive after a while, there may be times when you want to carry your digital photo frame away from home, and having a battery option is nice. So look though the frame's specifications before you buy to determine whether it can run from batteries and AC power. If you have a lot of photos with vertical orientations, see whether your digital photo frame can be physically turned to a vertical orientation, allowing you to display those photos with a natural look. Some digital photo frames can only operate in a horizontal orientation, and vertically oriented photos are displayed at a smaller size. When cleaning your digital photo frame, you should be able to clean most spots with a dry, cotton cloth or a slightly damp electrostatic wipe. Essentially, anything you would use to clean your LCD TV or laptop computer screen can be used with the digital photo frame screen. Fingerprints are common on digital photo frame LCD screens because those viewing the screen often want to hold the frame, just like they'd hold a photo print. If you have a particularly stubborn fingerprint or smudge on the screen, you can use a tiny amount of water on a damp cloth to clean the smudge. Just be sure to place the water directly on the cloth, rather than directly on the screen. Digital photo frames make a great photography-related gift , too, if you're looking for something to give grandma and grandpa something for a special occasion. You can grab great deals off apps like Wish as long as you plan ahead. Then take the time to load the digital photo frame with a variety of photographs that you know they'll appreciate, so all they have to do is plug it in and turn it on, allowing them to enjoy the photos immediately!